You want to run SUPER SUCCESSFUL purpose-driven business. You want to serve others by doing your best work. Getting absolutely clear on your soul, ideal client and your marketing message. Easier said then done. I know. 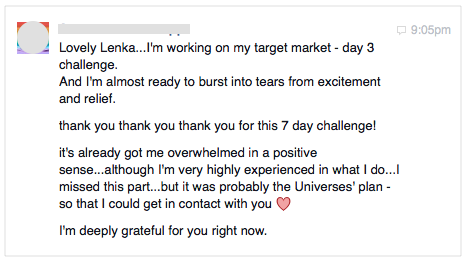 7 Day Clarity Challenge for you. Your soul, ideal client – the client you are meant to serve. Not sort of, or kind of, but meant to serve. You’ll become clear on their needs, desires and what they need from you as their coach. Your marketing message – how to communicate what you do to your ideal clients, so you can attract them easily. It will take you about 30-60 minutes to complete each of the seven daily challenges. Result? You'll niche your way to freedom!